(Rover Parking Spot): The Lunokhod 1 rover in its final parking spot on the moon. A team of physicists led by professor Tom Murphy at UC San Diego successfully signaled the Lunokhod 1 rover after the LRO camera (LROC) had determined the rover’s coordinates. Murphy used the LROC data to pinpoint with laser pulses the exact location of the long lost light reflector left on the lunar surface by the Soviet Union nearly 40 years ago that many scientists had unsuccessfully searched for and never expected would be found. The French-built laser reflector was sent aboard the unmanned Luna 17 mission, which landed on the moon November 17, 1970, releasing a robotic rover that roamed the lunar surface and carried the missing laser reflector. The Soviet lander and its rover, called Lunokhod 1, were last heard from on September 14, 1971. “No one had seen the reflector since 1971,” said Tom Murphy, an associate professor of physics at UCSD. He heads a team of scientists engaged in a long-term effort to look for deviations of Einstein’s theory of general relativity by measuring the shape of the lunar orbit to within an accuracy of one millimeter, or about the thickness of a paperclip. This is accomplished by timing the reflections of pulses of laser light from reflectors left on the moon by Apollo astronauts and turning the timing measurement into a distance. Three reflectors are required to lock down the orientation of the moon. A fourth adds information about tidal distortion of the moon, and a fifth enhances that information. “Lunokhod 1, by virtue of its location, would provide the best leverage for understanding the liquid lunar core, and for producing an accurate estimate of the position of the center of the moon—which is of paramount importance in mapping out the orbit and putting Einstein’s gravity to a test,” said Murphy. Murphy said his team had occasionally looked for the Lunokhod 1 reflector over the last two years, but faced tall odds against finding it until recently. The breakthrough came last month when the high-resolution camera on NASA’s Lunar Reconnaissance Orbiter, or LRO, obtained images of the landing site. The camera team, led by Mark Robinson at Arizona State University, identified the rover as a sunlit speck on the image—miles from where Murphy and his team had been searching (see: http://www.nasa.gov/mission_pages/LRO/multimedia/lroimages/lroc-20100318.html). But before that, the existence of the reflector or its precise location was unknown. On April 22, his team sent pulses of laser light from the 3.5 meter telescope at the Apache Point Observatory in New Mexico, zeroing in on the target coordinates provided by the LRO images. Murphy, together with Russet McMillan of the Apache Point Observatory in Sunspot, NM, and UCSD physics graduate student Eric Michelsen found the long lost Lunokhod 1 reflector and pinpointed its distance from earth to within one centimeter. They then made a second observation less than 30 minutes later that allowed the team to triangulate the reflector’s latitude and longitude on the moon, in other words its exact spot on the moon, to within 10 meters—“not bad for a half-hour’s work,” said Murphy. In the coming months, he estimates it will be possible to establish the reflector’s coordinates to better than one-centimeter precision. The return signal from the reflector was measured by Murphy’s team as a collection of individual particles, or photons, of laser light. The discovery of the Soviet reflector came as a surprise, because scientists had actively searched for it for nearly four decades without success. Many scientists had speculated that the Lunokhod 1 rover might have fallen into a crater or parked badly, with its reflector not facing the earth, which would have prevented it from being located by laser pulses. Murphy and his colleagues found in a study they published this month that lunar dust may be obscuring the reflectors on the moon (see: Moon Dust). His team found that the laser light they bounce off reflectors on the moon is fainter than expected and dims even more whenever the moon is full. Murphy’s project, dubbed APOLLO (the Apache Point Observatory Lunar Laser-ranging Operation), is supported by the National Science Foundation and NASA, and includes scientists at the University of Washington, Harvard University, the Massachusetts Institute of Technology, Humboldt State University and the Apache Point Observatory. 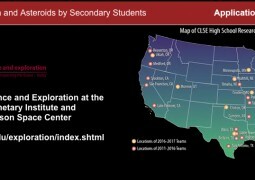 The Exploration of the Moon and Asteroids by Secondary Students (ExMASS) program envelops students in the process of science.